“Losing my mother was the saddest moment of my life. I am forever grateful to have her as my mother,” posted Clavel Campugan on her Facebook account during her mother’s 56th birthday. The young Campugan expressed that it is very hard for her and her siblings to accept that their mother now rests in heaven and that there is no single day that they would not miss her. For them, Ofelia Campugan is like a northern star that guides them in the proper direction. The Campugan Family poses after Pamela’s (second from right) graduation last March 15. With her (from left to right) are Haneleth, Kimberly and Clodualdo to witness the momentous event. The Campugan family of barangay Poblacion, Cordova, Cebu finished as second runner-up in the 2018 Huwarang Pantawid Pamilya National Search during the Pantawid Pamilya National Family Day held in SM North EDSA Skydome in Quezon City on October 14, 2018. The family went to Quezon City to receive the award except Ofelia who was advised by the doctor to rest. It was Ofelia’s can-do attitude and willingness that made their family famous for talent contests in their town. She joins “balak” contest and other contests in their town. Her children have also been joining contests such as quiz bowl, declamation, song and dance, beauty pageant, poetry, writing and sports competition. Once you witness them dance, sing, deliver poems, you cannot help yourself but laugh and be amazed by their God-given talent. With all the struggles and challenges that have to face, they proved that perseverance, hard work, faith and love will conquer them all. More than one month after they received their national recognition, Ofelia succumbed to death in the presence of her husband and children. “Sakit man, padayon lang gihapon ug amo nalang dawaton (Though it is painful but we have to move on and just accept it), said Clodualdo in dialect. The children would always recall how their mother would find ways just to earn money to help their father provide their daily needs. 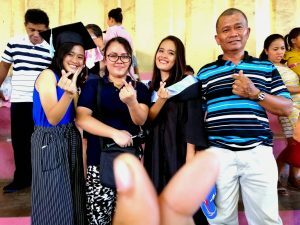 “Tungod ni sa akong mga ginikanan, sa ilang sakripisyo ug kakugi mao nga naka-graduate ko, kami manag igsoon (It is because of my parents, their sacrifices and hardwork I was able to graduate and my siblings),” said Pamela Campugan who graduated last March 15, 2019 with the degree of Bachelor in Elementary Education from Cordova Public College. Pamela said that her mother is her greatest inspiration. Clofel Mae will also graduate in Grade 12 this coming April 5, 2019 and she plans to take an engineering course in college and Haneleth, the youngest child, will finish Grade 10 next month. Both are monitored children under the Pantawid Pamilyang Pilipino Program (4Ps). The eldest child, Kimberly still works as a Production Planning and Inventory Control staff at the Mactan Export Processing Zone Authority (MEPZA) in Lapu-Lapu City. Clavel is currently working in ToyoFlex as a Human Resource staff and Jesper just got hired as an office staff in Cordova Cooperative. The Campugan family had given us so much inspiration. Indeed, the family’s story of trials and triumphs will always remain in our hearts. Their loss is after all, the beginning of a new journey. They have lost their northern star but they have already secured each one of them a burning torch within their hearts. They may have lost a cast in their theatrical play but for them as they positively and always do – the show must go on.